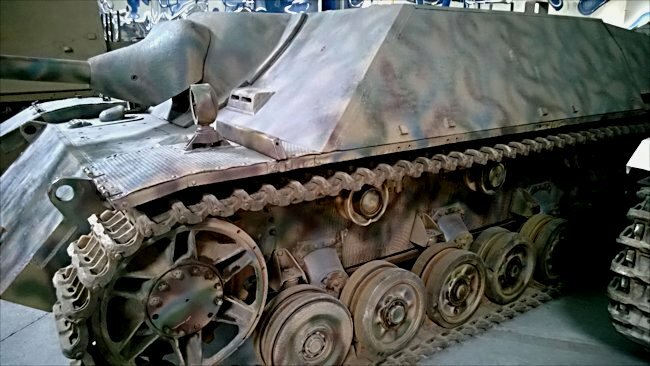 This German WW2 Jagdpanzer IV Ausf. F (L/48) Tank Destroyer (Sd.Kfz. 162) can be found at the French Tank Museum in Saumur in the Loire Valley. The Museum is called Musée des Blindés ou Association des Amis du Musée des Blindés, 1043, route de Fontevraud, 49400 Saumur, France www.museedesblindes.fr . The word Blindés means armoured. On 16th December 1944 in the Belgium and Luxembourg Ardennes German tanks and infantry attack American forces along a 100km front in the cold snowy weather of winter. The ‘Battle of the Bulge’ has just begun. The 12th SS Division were tasked with attacking westward, into Belgium north of the Ambelve River towards the village of Rocherath-Krinkelt held by the US 99th Infantry. The 12th SS Division had 14,000 infantry, 90 tanks and 60 self-propelled guns, including 40 Jagdpanzer IV tank destroyers. They were based on the chassis of the Panzer IV tank with its eight not six small running wheels. It was protected by 80mm of frontal sloping armour. It could reach speeds of 40km/h thanks to its 350hp engine. Its main gun was a 75mm high velocity cannon that could penetrate nearly all Allied tanks’ armour. What it has not got was a lot of fuel. German Jagdpanzer IV tank crew Sergeant Hans Bauman , 12th SS Tank Destroyer battalion remembers, "You cannot start an offensive that leaps forward if you are running out of fuel. You have to watch ever litre of fuel you use. A speedy progress was just not possible. Inwardly we were all hoping to meet American fuel dumps." "On December 18th we attacked Krinkelt. We made it into the centre of the village by the water tower. Close by there was a hay field with a village where we assumed the Americans were waiting for us. We opened fire. There was some hedges to our right. We suddenly came under fire from American anti-tank guns. It was very well camouflaged in there. It hit us and our company commander’s Jagdpanzer IV on the side." "He was leaning out of the hatch with his assault rifle to shoot back at the American gunners. He took a deadly blow to the neck from flying shell parts. The gunner and my hat and head set were blown off our heads from the explosion. The ambush had been placed so cleverly and hit us at our side weak spot that we had to bail out. We all made it out of the panzer though the driver was badly wounded. For me and my Jagdpanzer crew the operation at Krinkelt had ended." The American anti-tank gunners were equipped with a towed 3 inch 76.2mm M5 Anti-tank gun which could penetrate 80mm armour on the German Jagdpanzer IV at 1,000 yard and its 50mm side armour at 2,000 yards. This was the last successful battle these guns were used in because the Americans found the gun crews were suffering disproportionate casualties cause by German small arms and HE shell fire compared with the crews of self-propelled tank destroyers like the M10 Wolverine who had better armour protection. The fighting lasted for two days in and around Rocherath. On the night of 20th December German troops had secured the site of Rocherath-Krinkelt. The double village was occupied by the Germans until the end of January 1945. 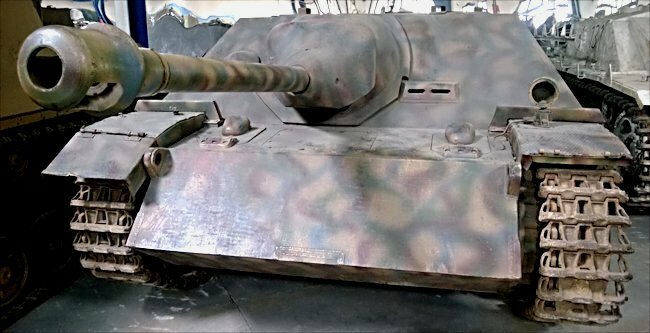 Where can I find other preserved Jagdpanzer IV?